Figure 1. Debalin Sarangi, a UNL Ph.D. student of Weed Scientist Amit Jhala, demonstrating research plots to clientele during Field Day. Palmer amaranth, a member of the pigweed (Amaranthaceae) family, is one of the most troublesome weeds in corn and soybean fields. Of particular concern is Palmer amaranth in south central Nebraska resistant to atrazine and HPPD-inhibiting herbicides (Callisto, Laudis, Impact). This is due to its proximity to intense seed corn production, which is heavily reliant on these herbicides for weed control. Figure 2. UNL Weed Scientist Amit Jhala discusses a project with the group. To share research information on this topic a Herbicide-Resistant Palmer Amaranth Management Field Day was held Aug. 4 near Shickley. 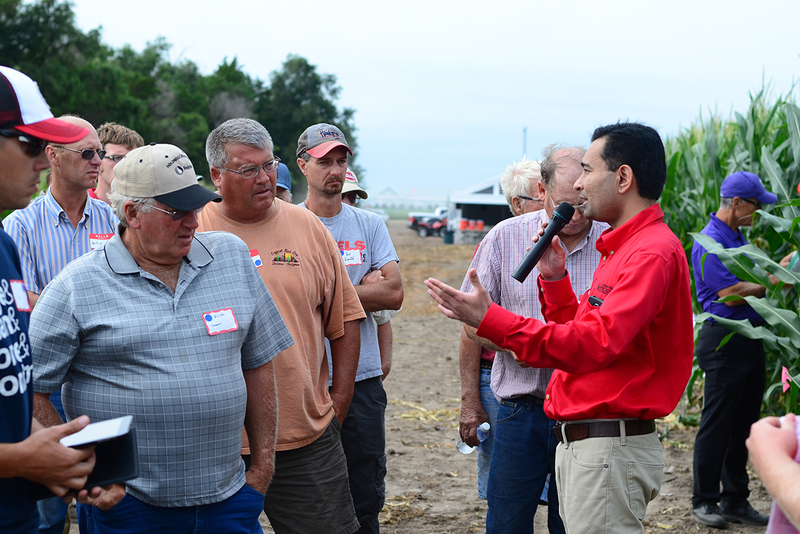 Amit Jhala, assistant professor and Nebraska Extension weed management specialist, organized and led the tour. Roch Gaussoin, head of the UNL Department of Agronomy and Horticulture, gave the welcome address. Curtis Thompson, a professor of weed science at Kansas State University, discussed Palmer amaranth identification, biology, and management in corn and soybean. A total of 105 were in attendance including growers, crop consultants, extension educators, graduate students, industry representatives, and other clientele. Jhala and team members demonstrated several projects for control of herbicide-resistant Palmer amaranth in field and seed corn and looked at efficacy, crop safety, and comparison of new herbicides in UNL's unbiased comparison trials. Stevan Knezevic, extension weed scientist, demonstrated projects related to dose response of palmer amaranth to atrazine and HPPD inhibitors (Callisto, Laudis, Impact). Graduate students Debalin Sarangi, Zahoor Ganie, Ethann Barnes, and Parminder Chahal showed a research project on various aspects of Palmer amaranth control in field and seed corn. The Field Day was sponsored by Nebraska Corn Board. Irvin Schleufer, Sharon Hachtel, Caleb Wilford, Wendy Morrison, Ian Rogers, Whitney Walters, and Lyndsay Drudik provided help with registration and tour logistics.